in Obergefell v. Hodges (and consolidated cases), the marriage equality cases. 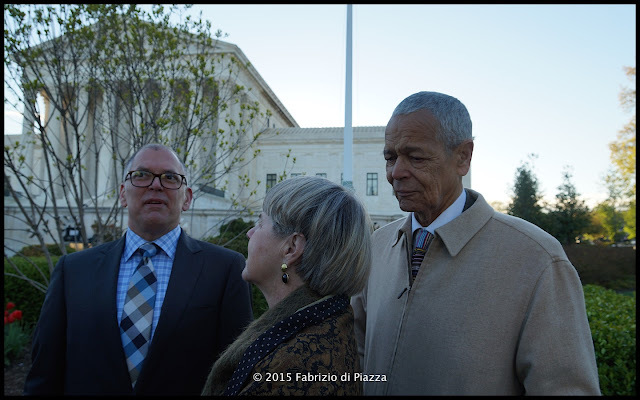 Julian Bond, an essential part of the Civil Rights movement, died on Sunday. The obituary in The New York Times, Julian Bond, Charismatic Civil Rights Leader, Dies at 75, offers a sense of Mr Bond's extraordinary life. I was at the Supreme Court on 28 April 2015, the morning the Court heard oral argument in Obergefell v. Hodges, the marriage equality cases, and shot the photograph (above) of Mr Bond and Pamela Horowitz, his wife, who were standing in line and talking with Mr Obergefell.